This program brought together young football players from 64 countries who acted as ambassadors for the program. Twelve-year-old boys and girls were united in eight international Teams of Friendship. The role of the coaches was performed by young players from previous seasons. The International Friendship Camp was held from June 27-29. Young coaches and famous football players helped train young football players to establish relationships between teams, elaborate on team tactics and help them feel the support of other team members. 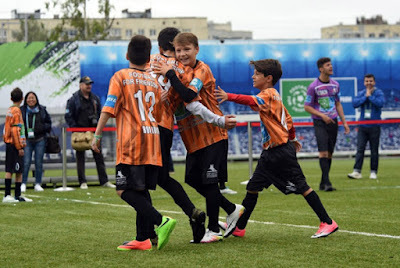 On the July 1, football players of the FIFTH SEASON OF GAZPROM FOOTBALL FOR FRIENDSHIP INTERNATIONAL CHILDREN'S SOCIAL PROGRAMME met on the emerald football field and demonstrated to guests from all over the world that friendship is possible regardless of gender, physical abilities and nationality. "I enjoy being here. My first time here I was a player and this time I am a young trainer. This new role is quite difficult for me, because I have to be an example for my team and lead them. I am sure that my future will be related to sport," the only young girl coach said. Before the friendship final, the main coach of St. Petersburg's team of rugby on wheelchairs took place in the draw. The culmination of the competitive part of the FIFTH SEASON OF GAZPROM FOOTBALL FOR FRIENDSHIP INTERNATIONAL CHILDREN'S SOCIAL PROGRAMME was a unique award ceremony for the finalists. The captains of the teams awarded each other medals, diplomas and special prizes. Young players who did not participate in the final game held a number of friendly meetings to support the values of the programme FOOTBALL FOR FRIENDSHIP. Young sportsmen were supported by the main Russian ambassador of the program, the best scorer in the history of the Russian national team Alexander Kerzhakov, the head coach of the Russian national team Stanislav Cherchesov and the first person of the Russian Football Union. More than 200 journalists from leading sports international media and representatives of football associations attended the games.